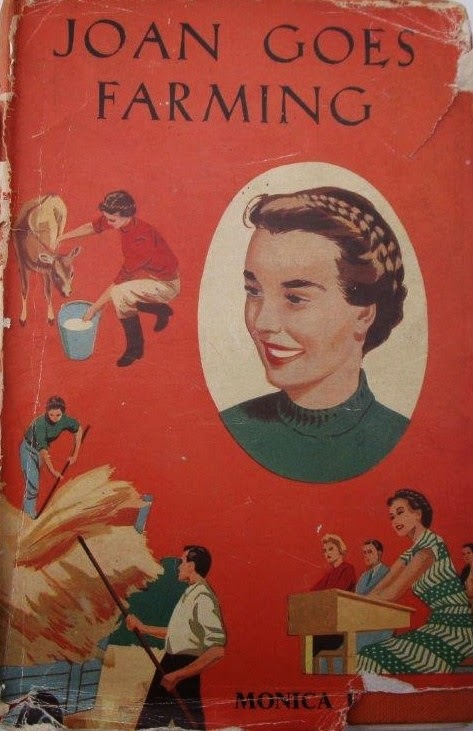 Ah, Joan Goes Farming. Published in 1954 by Bodley Head as part of its career novels series, it's a title I've never actually managed to track down. When I was writing my book, the availability of titles was occasionally a problem. How can that be, you ask, when you must have hundreds of the things? I do, but unfortunately not every title by every author, and you can safely assume that when writing a book on the things, the one title you haven't got is the one that tells you something pivotal about the author. The Monica Edwards chapter, as originally envisaged for Heroines on Horseback, dealt just with Monica Edwards "pony" books: Wish for a Pony, The Summer of the Great Secret, No Mistaking Corker and The Midnight Horse. It didn't take long until I'd stretched this out to include some of her other stories, arguably just as horsey as those four: Cargo of Horses, for one. I had shillied and shallied while writing the book, until it was suggested to me quite strongly by my usually imperturbable editor that it might be an idea if I got on with things. I did. Chapters flew from my pen. The end was in sight. And then the Monica Edwards chapter came back. Could I, they asked, actually cover all the books? Many of their readers were Monica Edwards fans, and I could afford to extend myself more than I had on some of the other authors. What this actually meant in practice was that I had to read well over 25 books, and read them fast. Joan was one of the ones I hadn't read, and I was lucky in that the wonderful person who runs our local Chalet School group had one, which she let me borrow (thanks Pam). And does Joan say anything pivotal about the author? I'm not sure it does. She didn't make it into the final cut of my book. Both Rennie and Joan followed the plotlines Bodley Head wanted for the series: girls could have careers, but marriage must be waved at the end of the book as a possibility. Whether it's a possibility Monica saw her characters actually embracing, I do not know. It seemed to me then, and does now, a terrible shame to do all that work and then give it up because you get married. I do wonder how Monica saw Tamzin and Meryon, Dion and Rissa, and Roger and Lindsay in later life. Do let me know what you think. Yes - I don't think I'd ever dare write it though! I do like the idea of Meryon as an embittered City businessman. That sounds very likely. Ditto Lindsay, though I see Roger, who is fundamentally law-abiding, being agonised about the whole thing. Roger I think will be left alone with the children A LOT.